Sure, cats are predators, but apart from the occasional bathroom caterpillar, there aren’t too many fun opportunities for them to hunt or prowl around your decidedly domestic apartment. Have you considered a cat food puzzle? According to a new University Of California-Davis study of more than 3,000 pet owners, 30% of online survey respondents reported that they use food puzzles, which “benefit domestic cats by bringing out their natural foraging behavior.” (About half, though, had never tried them.) The study was published in the Journal Of Feline Medicine And Surgery. As study lead author Mikel Delgado, a postdoctoral researcher on cat behavior at UC Davis, explains: “Before cats were domesticated, they lived in the wild where they hunted for food. 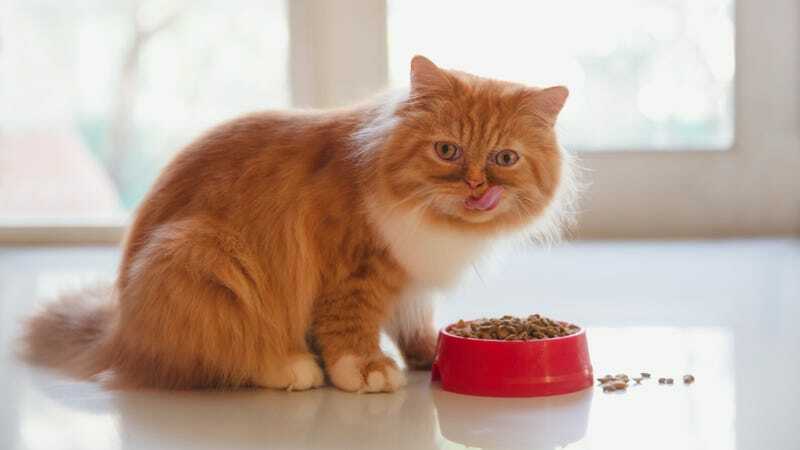 Then humans came along and took their jobs away.” A food puzzle can aid you cat’s mental stimulation, perhaps helping save them from a Garfield-like fate. While some respondents complained that their cats were too lazy to figure out the food puzzle, Delgado stressed the importance of making the puzzle fairly easy for the pets at first, saying that most healthy cats should be able to figure out and use a puzzle without too much assistance. After all, a hungry cat should be able to draw on those old crafty hunting skills to be able to extract wet or dry food even from a complicated plastic contraption.